Jennifer said when you’re asking if it’s time to quit that could mean several things: maybe you need a reset, new options, a plan for moving forward or an advocate at work. Or it might not mean any of those things, and you just feel confused. It’s a difficult situation and one that might stem from a real need for change or just a temporary slump. It depends on where you are and where you want to be. Some might see the only option open to them is to quit, but sometimes the best option is to stay put. You might just need to do something different to recalibrate your interest, like try move your desk, change your role or try new software. What’s Happening When You Start Questioning Your Job? Jennifer explored what is motivating the dissatisfaction that makes one question whether they should leave their job. It could be the itch of the start of a new season in your life or career. It’s natural to grow and want to progress and challenge ourselves. You can feel as if you’re in a rut, doing the same thing, over and over again. However, the issue might not be internal. There are external forces that can push one out of a job. Think of environment changes in the office, such as a toxic, hostile or stagnant culture—or a bad boss. What Are the Signs That You Need a Job Change? There are many red flags to be aware of that can indicate that it’s time to move on. Keep an eye out for the the following warnings: feeling bored, depressed, lost, stuck, frustrated or stagnant in your position. Or, you might have no enthusiasm or zip; it’s important to be happy at work. What Is Stopping You from Acting? You might be able to identify the above emotional states as indicators of a need for change, and a pull to leave your position and seek another job, but why aren’t you doing anything about it? That’s complicated. It could be fear. You might be fearful of the financial cost or that you’ll lose your identity, which might have been overly wedded to the job. Perhaps you have a lack of vision. It’s hard for you to see beyond the horizon. You’ve been at the job so long that it’s impossible for you to even imagine another professional reality. It could also be an absence of goals or plan forward. It’s hard to make a move if you don’t know where you’re going. 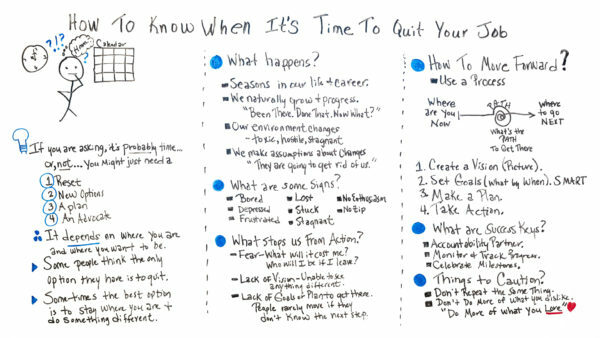 How Can You Move Forward and Quit Your Job? The first thing to do is know where you are and then plot where you want to be. Then it’s a matter of connecting those dots: that’s the path. To map out that path, start by creating a vision. A picture is worth a thousand words, as they say, and could be the best way to capture the vision you see for your future. Once you have vision, it’s now time to set up a series of goals. You can use the SMART tool, which is an acronym for specific, measurable, attainable, realistic and time-bound. Now write a plan that schedules those goals, breaks them down into tasks and creates an action plan. Then, of course, act on it. To ensure success it helps to have an accountability partner to make sure you’re making the right choices and progressing as planned. Then monitor and track that progress. Don’t forget about celebrating when you achieve milestones; you deserve it. Lastly, Jennifer cautioned about repeating yourself and doing the same thing that got you into this rough patch. Certainly, don’t double-down on what you dislike: do more of what you love. Pro-Tip: Once you’ve made the decision to quit, make sure you know how to quit your job without burning any bridges. For example, never trash talk your former employer. You need a good recommendation, and you never know if you might work with the person again. Take it Further: Make sure you write a resignation letter! Read our blog for tips and examples. You might just need a reset in your career. You may need new options, a plan, and an advocate to get there. So, it depends on where you are and where you wanna go. Some people think the only option they have is to quit. However, sometimes the best option is to get a new plan and stay exactly where you are. So, let’s take a look. So, what happens…what happens when we start asking these questions? Well, there are seasons in our life and in our career. So, there are some cases where your environment changes. It may become toxic, may become hostile or stagnant. Sometimes we make assumptions about changes. So, what are some signs that it may be time to just do a check in? So, the signs can look like you may become bored or depressed. Sometimes really frustrated at everything. Sometimes it can feel lost or stuck or again stagnant and no enthusiasm and no zip in what you’re doing. So, what stops us from action? Well, many times it’s fear. “What will it cost me if I leave or change? Then, what will I be if I quit or if I leave?” Some people identify very strongly with the company they work for or even a role. So, if you take that away, they feel like they lose their identity. Sometimes it’s just a lack of vision. Unable to see anything different. Many times when we’re very busy and we’re heads down and working on a task and so many different projects, it’s hard to look up and get a different glimpse. That’s why I think it’s very important to maybe take vacations or get yourself out of your normal environment. It’s also good to go to conferences and listen to trends in your industry so you can get some ideas of what’s coming and how you can prepare for something new. Also a lack of goals or a plan to get there. Many times in my coaching business, I find that people just aren’t willing to move their feet and take action if they’re not sure exactly where they’re going. So, I like to work with them to get a plan. Many times, it’s just using a very simple process. It’s taking the time, and you can do this on your own just with a piece of paper, on a whiteboard, is ask yourself where are you now? Where are you now in your career? What are the things you really love? And what are the things you don’t really like doing anymore? And then where do you want to go next? Is there a certain company you wanna go to? Maybe it’s a different role or taking on some other responsibilities. So, depending upon where you are and where you wanna go, there’s a path. So, you need to know what’s the path to get there. It could be some more training, it could be some more experiences, it could be maybe, again, an advocate. So, here are the steps. So, create a vision. And I think a picture is worth 1,000 words. That’s why when people do vision boards, they’re very powerful because it helps you continue to have a picture of where you wanna go. And then set goals, specifically, what do you need to do by when. And again, having smart goals helps you get there. Specific, measurable, attainable, realistic and time-bound. So, again, make a plan with specific actions to get there, and more importantly, you have to take action. So, what are some success keys? So, I think it’s very important to have an accountability partner. It doesn’t necessarily have to be a coach or mentor, it could be somebody that you know really well, someone who knows you well and is in your corner and can rally for you so they can help you be accountable to take the actions and really help to call when you get stuck. Also, monitor and track your progress. If you’re trying to get somewhere, it helps you to track, “Where am I getting stuck?” And also, celebrate milestones all along the way. Again, when you have a plan, be excited about doing different things. If you finish a class or maybe do certain volunteer a certain project, be excited about that. And here are some things to caution. Sometimes we repeat our patterns and we repeat things. So, don’t repeat the same old thing. Many times I see people who just recreate the same job or opportunity, it just may be somewhere else. So, don’t do more of what you dislike. There was one young lady that I worked with and we built a brilliant plan and she was so excited about it. And our next accountability meeting, she came back and she had created a whole different process, a project, and a plan. She was gone in a totally different direction and I’m like, “What’s going on here?” So, she had created a same job that she totally disliked because she couldn’t believe that she could take the steps to go where she really loved. So, we just redirected her back to her plan, got her back on track and she ultimately got where she wanted to go next. So, it’s important, I believe, to do more of what you love. And with all of this, you can see it’s so important to have tools and different resources to get there. So, if you need a tool that can help you manage and track your project and take actions, then sign up for our software now at ProjectManager.com.